As a woman nears perimenopause, the number of small antral follicles recruited in each cycle diminishes and consequently insufficient Inhibin B is produced to fully lower follicle stimulating hormone (FSH) and the serum level of FSH begins to rise. Eventually the FSH level becomes so high that down regulation of FSH receptors occurs and by menopause any remaining small secondary follicles no longer have FSH receptors. When the follicle matures and reaches 8–10 mm in diameter it starts to secrete significant amounts of estradiol. Normally in humans only one follicle becomes dominant and survives to grow to 18–30 mm in size and ovulate, the remaining follicles in the cohort undergo atresia. The sharp increase in estradiol production by the dominant follicle (possibly along with a decrease in gonadotrophin surge-attenuating factor) cause a positive effect on the hypothalamus and pituitary and rapid GnRH pulses occur and an luteinizing hormone (LH) surge results. The increase in serum estradiol levels causes a decrease in FSH production by inhibiting GnRH production in the hypothalamus. The decrease in serum FSH level causes the smaller follicles in the current cohort to undergo atresia as they lack sufficient sensitivity to FSH to survive. Occasionally two follicles reach the 10 mm stage at the same time by chance and as both are equally sensitive to FSH both survive and grow in the low FSH environment and thus two ovulations can occur in one cycle possibly leading to non identical (dizygotic) twins. FSH stimulates primary spermatocytes to undergo the first division of meiosis, to form secondary spermatocytes. FSH enhances the production of androgen-binding protein by the Sertoli cells of the testes by binding to FSH receptors on their basolateral membranes, and is critical for the initiation of spermatogenesis. Follicle stimulating hormone is typically measured in the early follicular phase of the menstrual cycle, typically day three to five, counted from last menstruation. 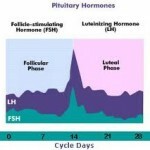 At this time, the levels of estradiol (E2) and progesterone are at the lowest point of the menstrual cycle. FSH levels in this time are often called basal FSH levels, to distinguish from the increased levels when approaching ovulation. FSH levels are normally low during childhood and, in females, high after menopause. The most common reason for high serum FSH concentration is in a female who is undergoing or has recently undergone menopause. High levels of Follicle-Stimulating Hormone indicate that the normal restricting feedback from the gonad is absent, leading to an unrestricted pituitary FSH production. Most of these conditions are associated with subfertility and/or infertility. Therefore high FSH levels are an indication of subfertility and/or infertility. The use of hormones, such as testosterone, estrogen, and progesterone (including birth control pills). The use of medicines, such as cimetidine, clomiphene, digitalis, and levodopa. Make sure your doctor has a complete list of all the prescription and over-the-counter medicines you are taking, including herbs and natural substances. Having a test such as a thyroid scan or bone scan that uses a radioactive substance within 1 week of the FSH test. FSH is available mixed with LH activity in various menotropins including more purified forms of urinary gonadotropins such as Menopur, as well as without LH activity as recombinant FSH (Gonal F, Follistim, Follitropin alpha). It is used commonly in infertility therapy to stimulate follicular development, notably in IVF therapy, as well as with interuterine insemination (IUI). Elevated FSH receptor levels have been detected in the endothelia of tumor vasculature in a very wide range of solid tumors. FSH binding is thought to upregulate neovascularization via at least two mechanisms – one in the VEGF pathway, and the other VEGF independent – related to the development of umbilical vasculature when physiological. This presents possible use of FSH and FSH-receptor antagonists as an anti tumor angiogenesis therapy (cf. avastin for current anti-VEGF approaches). This entry was posted in Uncategorized and tagged estradiol, follicle, FSH, gonadotrophin surge-attenuating factor, interuterine insemination, luteinizing hormone, ovulate, perimenopause, progesterone, sertoli cells, spermatocytes, testes on June 23, 2012 by alwin.